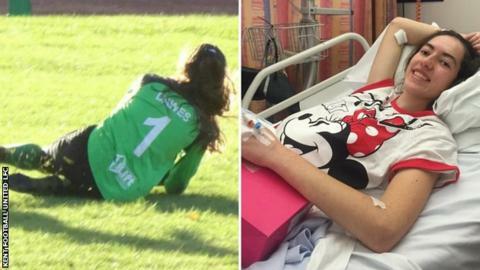 England internationals Fran Kirby and Carly Telford are among those to send well wishes to an 18-year-old goalkeeper who has suffered a stroke. Jordan Dawes plays for fifth-tier Kent Football United in the London and South East Regional Women's Premier League. The club said they were "devastated" but overwhelmed by support, after she underwent tests in hospital on Friday. Dawes, from Knole in Kent, is a former youth goalkeeper at Charlton Athletic, where she played until the age of 16. She was a member of the Kent side that lost narrowly on penalties to Luton Town in the Women's FA Cup first round on 11 November, having progressed through three qualifying rounds and the preliminary round to reach that stage. The club, who have won three promotions in a row, added in a statement on social media that they will "be doing something for Jordan and her family and want them to know we are thinking of them in this time. "We have been overwhelmed by the support for Jordan. Football coming together in such difficult times. The appreciation we have for your support we have no words for. Stay positive Jordan, you are such a strong person!" Kent's league match against London Corinthians on Sunday will go ahead as planned. According to the Stroke Association, childhood stroke - from the 28th week of pregnancy up to the age of 18 - affects around five out of every 100,000 children a year in the United Kingdom.